Want to find the point midway between two locations? Then you're looking for the midpoint! The midpoint of a line segment is the point located midway between the endpoints of the line segment. This tutorial tells you about the midpoint of a line segment. Take a look! A point is a fundamental building block of math. Without points, you couldn't make lines, planes, angles, or polygons. That also means that graphing would be impossible. Needless to say, learning about points is very important! That makes this tutorial a must see! What is a Line Segment? A math term can really tell you a lot about the thing it's describing. Take the term line segment. A line segment is just part of a line! In this tutorial, learn about line segments, how to name them, and what the midpoint of a line segment is! What are the Endpoints of a Line Segment? A math term can really tell you a lot about the thing it's describing. Take the term 'endpoints'. The endpoints of a line segment are just the 'points' located at the 'ends' of the line segment! That's an informative name! Watch this tutorial to learn about endpoints of a line segment. What's the Midpoint of Two Points on a Number Line? If you have two points on a number line, the midpoint is the point that is located directly midway between the two points. Take a look at this tutorial and learn about the midpoint of two points on a number line! How Do You Find the Midpoint Between Two Coordinates? 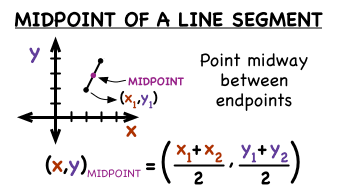 The midpoint of a line segment is the point midway between the endpoints of the line segment. This tutorial shows you how to take two endpoints and figure out the midpoint of the line segment. Check it out! How Do You Find the Midpoint of Two Points on a Map If You Have the Coordinates? When you're looking at a map, you can find the point midway between two locations by calculating the midpoint. This tutorial takes you through the process of finding the point midway between two cities.